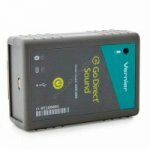 The Vernier Go Direct Sound Sensor is used to easily capture and evaluate waveforms. It directly connects via Bluetooth® wireless technology or wired via USB. Collect sound data wirelessly with the snap of your fingers. 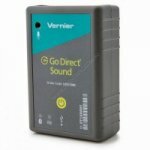 With sound-triggered data collection, Vernier Go Direct® Sound Sensor provides students with an easy way to capture and evaluate waveforms. Measure wave amplitude and sound intensity level at the same time to investigate the decibel scale, or take the sensor outside the classroom to discover sounds in their natural environment.